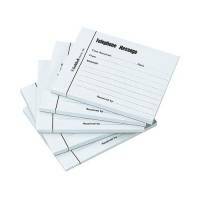 Challenge Yellow Telephone Message Pad 127 x 102mm Pack of 10 100080477 Pack of 10 Challenge Telephone message pad Yellow. Pre-printed layout for recording details consistently and quickly. Head bound with 80 sheets per pad. Easy tear-off pages. 127x102mm. 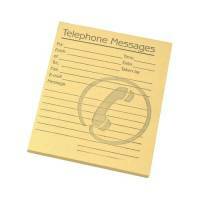 Guildhall Telephone 100 Leaf Message Pad (Pack of 5) 1571 Pack of 5 "Justso Telephone Message Pad. Each pad has 100 sheets of pre-printed Blue telephone messages, Size: 127x101mm (5x 4)." 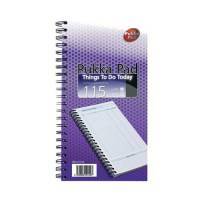 Pukka Things to Do Today Book THI11/1/115 Pack of 1 Pukka Things To Do Today Book. 115 sheets of 80gsm paper pre-printed with a to do checklist. Perforated sheets for easy removal. Wirebound to allow the book to lie flat. 152 x 280mm.